It took Oceanside PD Officers Marty Morabe (left) and Matt Lyons (right) 10 hours to successfully negotiate with a distraught armed Marine who had barricaded himself in an apartment to surrender. There were no injuries and no shots fired. It could have played out much differently – shots fired, injured officers, EDP taking his own life. But for these skilled negotiators, the outcome was as good as it gets. Officers Martin Morabe and Matt Lyons started their 10 hour dayshift on April 7 like any other day. What they didn’t know was that they would be tasked to take the lead roll in a 10 hour negotiations with a distraught Marine who was threatening suicide and armed with a firearm. The standoff began at 11:30 a.m. The man’s wife had returned home and discovered he was armed with a rifle and threatening to hurt himself. Police were notified and responded. Morabe and Lyons immediately tried to make contact with the distraught Marine. While this was happening other members of the Oceanside Police Department’s Crisis Negotiation Team (CNT) were activated. They began the coordination of resources and began to develop background intelligence on the troubled man. Martin and Matt began the process of trying to develop rapport so they could begin to defuse the tension. Negotiators are trained to develop strategies and work through highly volatile incidents. They typically work in teams to provide the safe removal of the barricaded subject from the situation and without compromising the safety of other police members on scene and the general public at large. On this night and after nearly 10 grueling hours of negotiating, the officers convinced the man to surrender. The Marine was taken to the hospital in a patrol car for an evaluation. 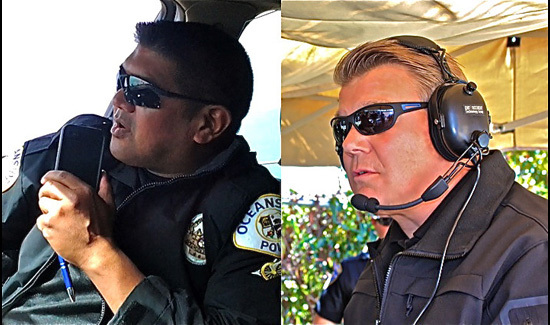 Oceanside Police SWAT & CNT members train & work together to successfully resolve countless high-risk missions that require a well planned and safe response when faced with potential threats. CNT members have a proven track record as seasoned field police officers and have a history of using sound judgment and decision making along with a calm approach to very difficult, tense situations. Once selected, negotiators complete a basis 40 hours Crisis Negotiators Course through the California POST, which is hosted by the FBI, San Diego Division. Quarterly training is also held throughout the county with local area law enforcement. Additionally, team members attend mandatory monthly in-house training, sometimes with the department’s police SWAT Team on reality-based situations. As CNT members progress, they attend additional schools such as Advanced Negotiator Course, Domestic Violence, and training that deals with handling people who are suffering from mental illness and or crisis.